Upgraded Infrared Burner & Cover w/RCS Grill. The RCS Cutlass Pro 38-inch natural gas BBQ grill features four (4) cast stainless steel burners with 60,000 BTUs and a 12,500 BTU stainless / ceramic rear rotisserie burner for a combined total of 72,500 BTUs of cooking power. This grill is constructed of 304 stainless steel for lasting durability in nearly any environment. This RCS grill also includes grilling zone separators that isolate specific cooking conditions to the specified grilling section. The stainless steel flame tamers prevent flare-ups for safer cooking, and 9mm stainless steel cooking grids distribute even heat for ideal grilling conditions. Cook delicious rotisserie meals in your own backyard with the included rotisserie kit. The Sure-Strike electronic ignition system ensures an easy and reliable start-up every time. Cool blue electronic LED knob lights and interior halogen lighting provide visibility for cooking in the evening. The temperature gauge in the hood helps you monitor cooking temperatures during your grilling experience. With a 760 square inch primary cooking area, and a 274 square inch secondary cooking area, the RCS RON38A natural gas BBQ grill gives you a total of 1034 square inches of grilling space. The outdoor kitchen counter depth should be at least 23 inches in order to open the grill hood. Cooking Grid Dimensions 38 X 20"
RCS Cutlass Pro gas grills have a lifetime warranty that warrants against any defects in the manufacturing and workmanship on the cooking grids, stainless steel housing, and stainless steel burners. Control valves are have a fifteen (15) year warranty, while flame tamers are covered by a three (3) year warranty. All other components are covered for one (1) year. When looking at the design of the RCS Cutlass Pro, I like how similar it is to most high-end grills. It’s built with 304 grade stainless steel and has “cool blue” LED control knob lighting with interior halogen lights. 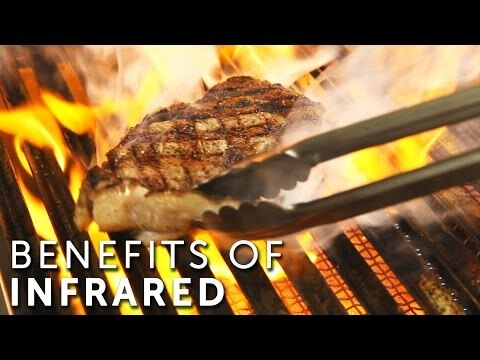 If you’re looking to add that “wow” factor in your grill, one with lighting is a good way to go. Just like other premium gas grills, the hood is double-lined to protect against discoloration. I also like the extremely reliable “sure-strike” electronic ignition system. The burners are cast stainless steel, which are well known for durability, low maintenance and high heat characteristics. The stainless steel flame tamers do a good job reducing flare-ups and they also help distribute heat across the grill. Stainless steel flame tamers have some advantages over ceramic briquettes, they're easier to keep clean and they have a faster response when you want to adjust the temperature. Another feature that caught our eye is the grilling zone separators, which are stainless steel partitions that allow you to divide the grill into temperature zones. 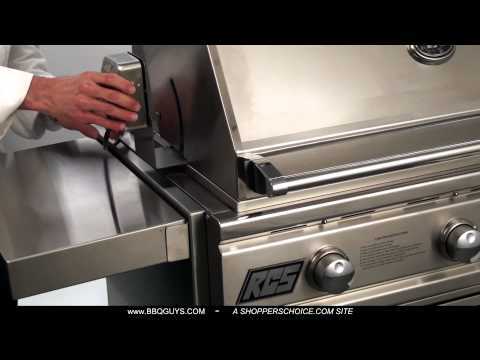 RCS also offers a full line of outdoor kitchen equipment to round out your RCS outdoor kitchen. RCS Cutlass Pro grills are backed by a lifetime warranty on stainless steel components, and a 15 year warranty on control valves (other components are covered for one year). It's clear that RCS doesn’t want customers to worry about the durability and performance of their grills. 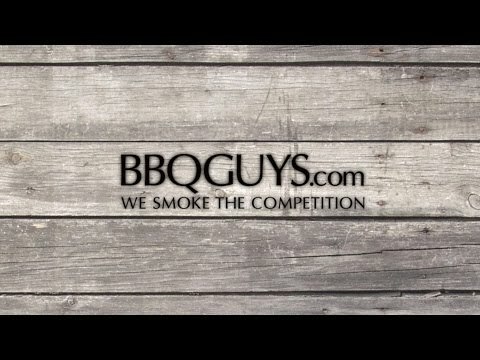 RCS Cutlass Pro Grills typically have the lowest BTU, and thus the lowest max heat output when comparing to similar grill brands in its class. You want an all 304 stainless steel gas grill with cool blue knob lights for a good value. 38 X 20" 39 7/8 X 17 1/4" 33 X 17 3/4" 37 X 19 1/2"
41 1/4" 39 1/2" 35" 38 1/2"
20" 20 1/2" 21 1/4" 22 1/4"
11" 10 1/4" 10" 9 1/4"